FRAMED – illuminating our inner lives. 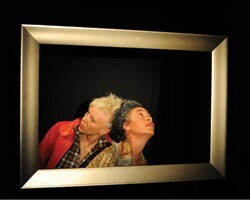 Two women are literally framed: at the intersection of visual art, theatre, dance, music and installation. In this spellbinding and intensely intimate, intercultural work, Tess de Quincey and Maori dancer Victoria Hunt explore the paradoxes of relationship through miniscule yet emotionally immense changes. Traversing the eight emotional states of the Natyasastra, the conerstone of traditional Indian arts. Framed provides a beautiful and compelling illumination of the moments that shape our lives.